How two RGB filter sets perform in planetary imaging? To make a color image with a mono camera you need RGB filters. 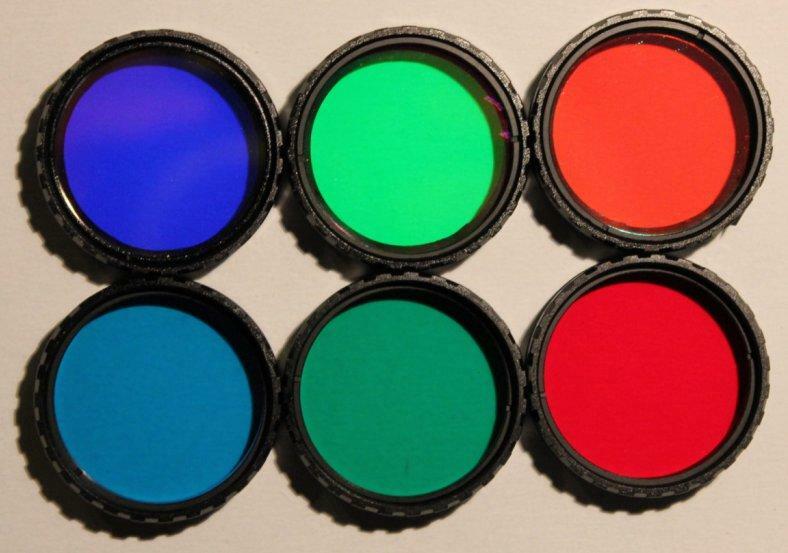 Good RGB filters have high transmission and sharp cut-on and cut-off wavelengths. Such filters are usually interference filters where the filter layer is put on a clear glass. Older filters made of colored glass mass are usually less efficient. Baader offers high-end interference LRGB filter as well "amateur" cheap set made of color glasses. The professional set is much more expensive than the cheap one. What's the performance difference between those two sets? Lets find out. I had the "amateur" set some time ago (and now I'm using the "professional" one. The amateur set I got for tests had lower filter cells when compared to the set I had some time ago. Also the blue filter has a turquish color (while it was darker blue in the old set). The filter datasheet provided by Baader isn't rather up to date (more on that later). The color glass filters doesn't block infrared and the set is designed to work with an IR/UV cut filter (L filter from the set). You put the L filter on the camera nosepiece and RGB filter in a filter wheel. Professional RGB filters will have the IR/UV block built in and they don't require filter stacking. Testing those sets in planetary imaging I could check few things - how much light they pass (how bright the image will be) or what are the final colors on a processed image. For the amateur set I also wanted to check how they will work with and without an IR/UV cut filter in the path. The set consists of few images - the standard color RGB version as well as RRGB (where red channel image was also used as luminance) and LRGB (where image taken with an IR/UV cut was used as luminance channel). The AVIs were stacked, sharpened with deconvolution and then combined into color images. Each color image was automatically color balanced by Nebulosity2. As you can see the colors are similar. Amateur set gave more reddish images, especially when used without an IR/UV cut filter. That's because the red filter in the amateur filter set is a longpass filter - it will pass all wavelengths from 610 nm (red) till far infrared. Without IR/UV cut filter it will pass a lot of infrared causing the red channel image to be much stronger than it should be. The brightness of a filter will depend of the light transmission ratio it has and the width of the band it passes. 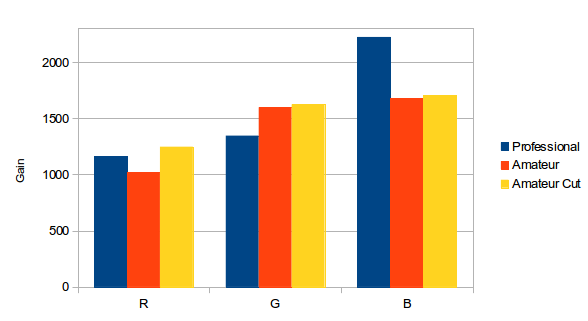 As you can see from the chart the blue professional filter is darker than the amateur one - it needs much higher gain. That's because it passes a shorter band of light. The amateur red without an IR/UV cut filter will pass also a lot of infrared which will make him very bright. What's funny is the IR/UV cut filter not affecting blue and green amateur filters. Like if they would not pass infrared (while looking on Baader charts - they should). Saturn is bright in red and also partially in infrared. It gets dimmer in green and even more in blue. Using Star Analyser diffraction grating and a bright star I could check what wavelengths those filters pass - do they or do not pass infrared. The L filter will pass only visible wavelengths. Anything on the right side of the band it passes is infrared. The red amateur filter is a longpass filter and as you can see it passes infrared nicely. 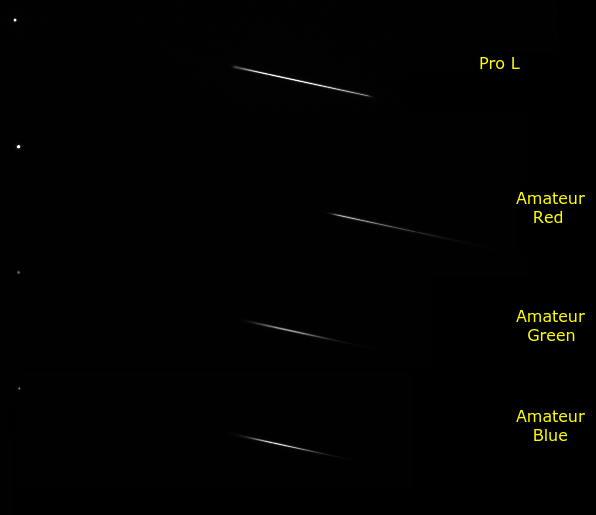 Green and blue pass similar bands of light (which may be the cause of more reddish color balance). What's is more interesting - they don't seem to pass infrared so they must be different glasses than those stated in the sheets. Lack of IR leak is actually a good thing. If you stack the amateur filter set with an IR/UV filter then you will limit the red filter brightness. It will improve the color balance for an RGB image but it will also make harder to get a high quality red channel image desired for an RRGB image. So especially for hard targets (like Saturn) it may be better to not add the IR/UV cut filter to get better and clearer "red" channel image. Blue/UV wavelengths are short, while red and infrared are longer. The longer the wavelength gets the less it's affected by atmospheric dispersion and "bad" seeing effects. That allows to get a clear and sharp images with infrared filters - thing usually not doable in blue channel. Telescopes will have lower resolving power in infrared than in short visual wavelengths, but in reality - red/infrared will nearly always win. As you can see on the above image - longer wavelength look better than those shorter - in good or bad seeing. Going to very dark infrared filters operating on long infrared wavelength you could get a crisp image, but cameras will lack sensitivity to provide a good final image. So there is always a limit on how far in infrared you can go. For planetary imaging both sets work nicely. The professional has good color balance, while the amateur isn't much worse while beign cheap. The decision is open. Red amateur filter is good for planetary and lunary luminance imaging, but only if not stacked with IR/UV cut filter. With typical interference filters IR/UV cut filter isn't needed so luminance filter can be used alongside RGB filters with not problems.